Onset dates and prevailing wind currents of the southwest summer monsoon. ఋతుపవనాలు భారతభూభాగంలో కనిపించే వాతావరణ విశేషము. A monsoon is a seasonal prevailing wind which lasts for several months. 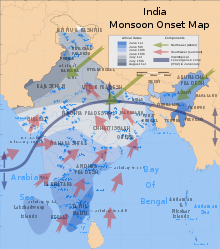 The term was first used in English in India, Bangladesh, Pakistan, and neighboring countries to refer to the big seasonal winds blowing from the Indian Ocean and Arabian Sea in the southwest bringing heavy rainfall to the region. In hydrology, monsoon rainfall is considered to be that which occurs in any region that receives the majority of its rain during a particular season. This allows other regions of the world such as North America, South America, Sub-Saharan Africa, Australia and East Asia to qualify as monsoon regions. In terms of total precipitation and total area covered, the monsoons affecting the Indian subcontinent dwarf the North American monsoon. The South Asian monsoon affects a larger number of people due to the high density of population in this part of the world. ఈ పేజీలో చివరి మార్పు 4 జూన్ 2014న 00:26కు జరిగింది.